Age spots do not spread though.. That's why I never referred to them as Cancer. I have another one to add to the list. See my lovely Seashell, this is what happens when a seller uses removezit to remove a spot and doesn't tell the buyer. I found out about a six months later when she mysteriously started to loose color. Well since this hasn't been answered yet, and I'm desperate to find out, what can you do about mildew inside a pony? I have a TE with mildew inside her legs, and I've been trying to research the best way to fix it. Please click the banner below and familiarize yourself with the sig size limits. In the future, please visit the Sigs&Gallery forum if you are unsure of your sig's size. I'm not sure what you can do about that, maybe you should try some kind of gentlish bleach and a toothbrush and leave the bleach in overnight? Maybe Oxyclean, I know that works quite well. I have updated the first post with pictures. I will start on filling in the answers on some of our questions soon. I wish I had a better way to keep this organized and easy to read for everyone. But, like I wrote on the first post, this is a work in progress, so it will hopefully become more organized and useful as time goes by. Honestly, until someone posted pictures of regrind on this thread, I had never actually seen it. I had only read descriptions of what it looked like. I just assumed Pony Bride had regrind issues because regrind is often described as looking like "pink highlighter". I thought it was even more accurate since my second Pony Bride also has the same pink markings (though on a much smaller scale). I definitely think it's worth more investigation. Edit: Also, if anyone has pictures of what they believe to be ingrained dirt, please post them. I would like to clarify the differences between pin dot mold and ingrained dirt. I don't think pony cancer "spreads" the way people think it does. I think most pony cancer can basically be attributed to mold... age spots are really also mold most of the time too. When someone says their pony has age spots I generally think 'spots of unknown origin.' It can be mold, stains, regrind, dye/chemical transfer spots. There may be technically be a chemical reaction that causes some of the spots but I think many mold stains are incorrectly classified as "age spots." I don't think it's a coincidence than manky sea ponies are sooo susceptible to them. In other words, I think that pony cancer, age spots, and mold are generally the same thing. We may have some time-based chemical reactions that also result in darkening spots, but if so, I don't think we reliably know how to differentiate these marks from mold. So, I assume that most of the spots are caused by mold, especially since it's super common to see different looking spots on the same pony (some will be round and have center dots, some will look like the center dot alone, some will be circular and have no center dot, some will be brown and irregular, and many will have regrind-like halos around them). Please note I don't think boiling is the answer--I think better storage is. I can't rule out whether or not boiling helps but it doesn't seem to be a fix-all. People act like pony cancer/mold is some sort of dangerous contaminate, almost like a virus. It's not. It's a mold that grows on pony plasticizer. As ponies age more of the plasticizer comes to the surface, so the pony becomes a better root bed for mold. The mold spores themselves are everywhere, it just takes the right conditions for them to start growing (some combination of humidity + plasticizer + temperature). You can prevent it by removing excess plasticizer from ponies and by keeping ponies in a dehumidified room. Supposedly it doesn't have to be that humid for mold to grow. Anyway, this is the accepted answer to most other collecting communities--strawberry shortcake doll collectors and cabbage patch doll collectors have to deal with the dreaded mold pox too, and they've pretty much accepted that the marks aren't contagious. I've also gotta say--boiling may be helpful, and it may not be. I've boiled ponies in oxiclean and watched their cancer get worse a couple months later. I only got it under control after I cleaned the tackiness out of their bodies and put them in an air conditioned room. I had to change my drying methods too... turns out ponies stay damp inside for a looong time after you clean them (I still kept feeling waterdrops inside the legs a month later). I've also stopped boiling/decontaminating ponies and I've found it makes no difference... cancer hasn't spread or gotten worse on any of my ponies in more than two years. I think we should start focusing on fixing the storage environment we keep our ponies in rather than boiling, disinfecting, and otherwise decontaminating. Anyway, I'll put a disclaimer on all this simply because I am NOT a scientist but I think I know a little more about this than the average collector. I'd like to figure out if our methods for targeting cancer really work. Right now we've got opinions and anecdotes, and I think it's great that we're really trying to organize our cancer/mold knowledge. I want to thank Ivy for sharing the remove-zit pic... sellers can do the same thing with acne creams, it's really annoying when they don't report it. I know from first hand experience that you can sometimes fade/remove cancer marks with remove-zit but this is the sort of damage it can do. It can damage ponies of any color, but it's most likely to hurt purple and blue ponies (those hues are very easy to fade). Anyone who is using remove-zit to repair ponies must be very cautious! I only suggest doing it to ponies you plan on keeping or that you're prepared to sell as bait. It can take months for the damage to become apparent. Thanks, glad to help. I'm just another person but this is a problem I've been reading up on and investigating first hand the last couple of years, so I wanted to add my two cents. I should probably also add that since different ponies are more prone to losing plasticizer that could account for why some ponies are more prone to cancer than others. 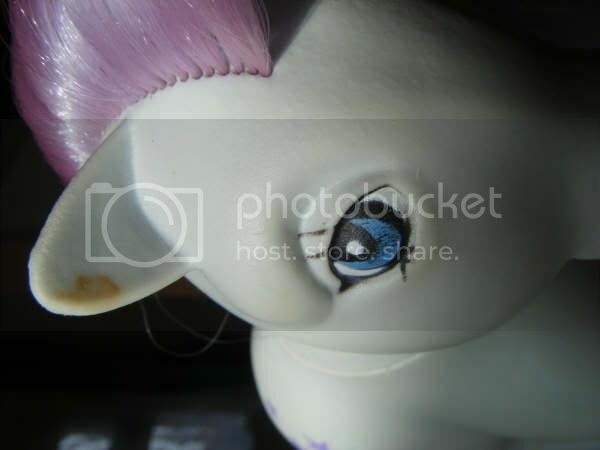 I read an article several years ago about a study done for a museum that concluded plasticizer loss is linked to Vinyl Deterioration Syndrome (that's the generic name for pony cancer). Plasticizer is the material that gets added to vinyl to make it more pliant. 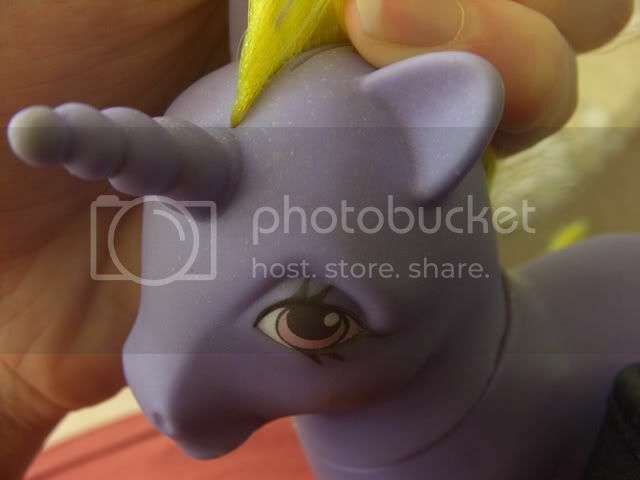 You'll notice it on the inside of ponies sometimes--it makes them kinda sticky as it seeps out of the plastic. It's really common (in my experience) to find tacky Big Brothers and Twinkle Eyes. I haven't opened up all my ponies to investigate whether or not you can use inner tackiness as a risk factor for cancer, but I'm interested in seeing if there's a correlation. Hmmm, would this be a good example of plasticizer causing age spots? My Chief has these two liquid drip shaped areas on him which have turned brown (prior to my buying him). It looks as if the C was remvoed before with nail polish or some other stuff and now (like with the ink killer) you can see that as time flies by. I've come to the same results. Making the pony wet is mostly just worse than not doing anything. Great thread. Ummm so does anybody know what these spots are??? lunarkai - So, you're saying pony cancer/mold/age spots are all the same thing? They just appear differently? I am just trying to figure out how I need to word the answers to the questions on the first post. I may hold off on putting answers up until we get more opinions on what all of this stuff really is. I read an article several years ago about a study done for a museum that concluded plasticizer loss is linked to Vinyl Deterioration Syndrome (that's the generic name for pony cancer). I love this! It is a name that makes so much more sense than "pony cancer". Do you remember what article that was? I'd love to get a scan of it. Also, you said one way to prevent mold spores from growing is to remove excess plasticsizer. How does one go about removing it? reddsetgogirl - The Chief looks so sad! Poor guy. I have a Masquerade that has the same type of pattern on her neck, but it's not quite as noticeable, but that could be due to the difference in color of the ponies. I am betting that it is some kind of "Vinyl Deterioration Syndrome" (VDS)Heeeheee, I love that way more than "Pony Cancer". toyviko - the first picture looks like rust to me. I could be wrong though. Is the second Blue Belle a Greek? If so, it might be something unknown since I've heard the Greek ponies have a different type of plastic. Either way, it could just be another form of VDS. Fizzy_NZ - the spots almost look like paint spatters, but if it is ingrained in the plastic, I have no clue. Have you have tried scrubbing her with a Magic Eraser to see if the spots come off?? It could also be some kind of pindot mold, too. I wonder if anyone else has the same type of spots on any of their ponies. The first pic is of an Argentina BB...so you think it's rust transfer from another object? Is there any way to fade it? The next 2 pics are a Macau BB...the weird thing is that the discolorations are in different shades of blue/violet, not brown. I think you can remove rust stains with rust remover. I've removed rust from my Sparkler with it before. I can't remember what the brand was. My boyfriend had a bottle of it out in the garage (cars are his hobby). It was in a white plastic spray bottle with red lettering, if that helps. I think you can buy CLR at regular grocery stores, though. I know there are people that have used it before on ponies, though I've never tried CLR for myself. I am not familiar with nirvanas, so I'm not sure if CLR or another type of rust remover would be safe to use on an Argentine pony. You might post in the Nirvana forum before you try it, just to be safe. As for the Macau, I can't explain why the markings are two different shades...perhaps one is really an ink marking and the other VDS. I am not sure...sorry I can't be more help! I hope someone here can help you figure out what the markings are.